We don't have a feed for My FanFare yet. I'll add that to the to-do list. That was a quick pony reward. Yay! pb is the Pony Whisperer! My FanFare feeds are go. You should see a link to the feed at the top of the My FanFare page under the headline. In the wake of the preposterously swift granting of this pony, I would just like to mention that NewsBlur is an excellent RSS reader, and well worth the $25 bucks a year I spend on it. Sorry, there are no My FanFare preferences set for the feed you requested. Hope me PB1 Kenobi, you're my only hope! I think I found the problem, scalefree. Give it another try. Heh: read the MeTa in The Old Reader (which for non-huge numbers of feeds is the cheapskate alternative to NewsBlur/Feedly etc), thought to myself "oh yes that does sound useful", come here to find pb has already implemented and debugged it. Wizardry. Hmmm, I had Fanfare showing in my Newsblur feed all along. Mysterious. FanFare, yes. This is MyFanFare; just my selected shows show up in the feed so I don't have to wade through the rest to find the ones I watch. Oh, I see. I just get there with the training feature of Newsblur, so I forgot about MyFanFare. We had a deal, Kyle: "The Old Reader (which for non-huge numbers of feeds is the cheapskate alternative to NewsBlur/Feedly etc"
Feedly is free, so Feedly is also a cheapskate alternative to NewsBlur/Feedly etc. I like Reeder for what its worth. 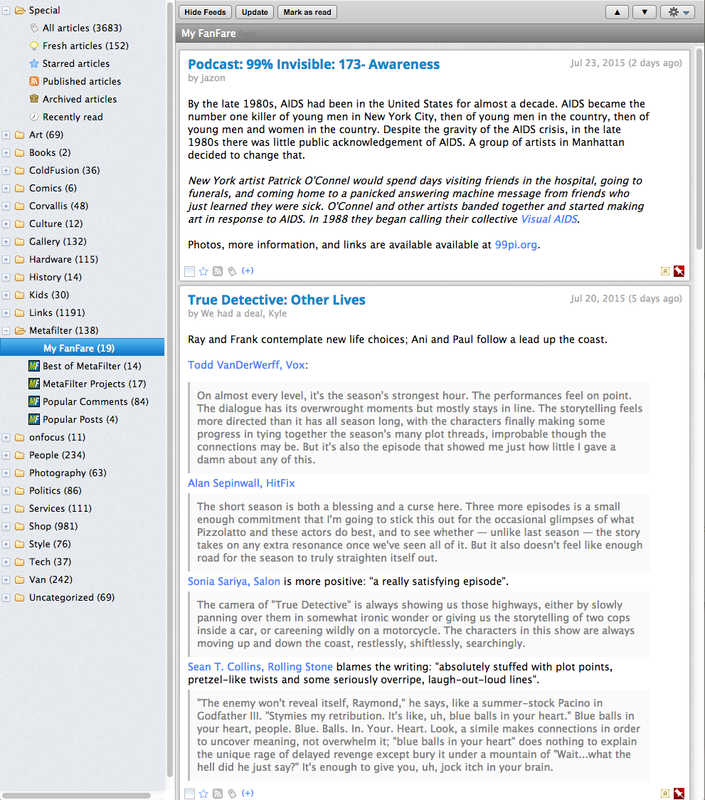 I use a locally hosted version of Tiny Tiny RSS that I've tweaked to look and behave like Google Reader. It's pretty good out of the box but if you're familiar with CSS and PHP you can really customize it. I use the free version of newsblur and love it. I've been using Tiny Tiny RSS pretty much right out of the box with no tweaks. Would you mind describing what you customized about it? Would you mind describing what you customized about it? Sure, it's been a while since I did the customizing but I think I mostly just took things away that I wasn't going to use. I put starring posts in the lower left corner and changed how dates and titles are displayed. Then I just did some basic CSS stuff to restyle everything so it looked more like Google Reader. Here's a screenshot. The downside to all this customization is that I'm way behind on updates. It works pretty well for me though so I don't have a big need to update.